The most famous portrait of Chopin, painted by Eugene Delacroix in 1838 (It is a fragment cut out of a larger painting portraying Chopin beside George Sand ). Frédéric François Chopin (Polish Fryderyk Franciszek Chopin, March 1, 1810 – October 17, 1849) was an important Franco-Polish composer and pianist of the early nineteenth century. In his voluminous compositions for the solo piano, practically all of which have remained in the standard repertoire, Chopin revolutionized the way the instrument was played, and moreover the relationship between the performer and the instrument. He was one of the first composers to apply the Romantic ethos to piano technique - his works make physical demands of the performer that surpass the late works of Beethoven, at least in terms of the expression of raw emotion. Nevertheless, his romanticism concealed a craftsmanship thoroughly schooled in older contrapuntal and harmonic methods - he was an avid admirer of J.S. Bach, and his works reveal a masterly combination of textural and harmonic innovation combined with old school discipline. 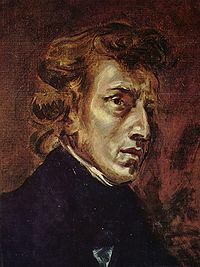 Chopin was born in the village of Żelazowa Wola, Poland, to a father who was a French national and a Polish mother. The family later moved to Warsaw when Chopin's father was offered a job teaching French. Chopin was a child prodigy, and through his father's connections with other intellectuals and aristocrats, he was able to travel outside of Poland at an early age to give concerts. This culminated in a series of concerts in Vienna in 1830, which were greeted with acclaim. During this sojourn, however, the November Uprising broke out in Poland, and Chopin found himself stranded in Vienna. He wandered through Munich and Stuttgart, before finally settling in Paris, where he would remain on and off for the rest of his life. Chopin quickly made for himself a good living teaching piano, and made friends among the aristocracy, as well as among the intellectual and musical elite of the French capital. He also played many concerts in aristocratic salons, and continuously composed ground-breaking piano works. He most closely identified with Polish dance forms, which found an eager audience among Parisians, who sympathized with the Polish revolutionary cause. In 1836, he met the radical feminist and author George Sand, the pen name of a Baronness Dudevant. In 1838 they began a high-profile relationship which would continue for the next 9 years. The couple spent a miserable winter in Majorca and several years in Sand's country estate of Nohant, where Chopin wrote some of his greatest works. He was however always hindered by poor health, and showed early signs of the tuberculosis which ultimately killed him. Chopin and Sand parted company in 1847, after a series of disputes among Sand's children. His health continued to worsen, and after a brief stay in London, Chopin died in 1849. Chopin is unique among the great composers in that his output is almost entirely for the solo piano. While the early 19th century witnessed many piano virtuosi who toured and played their own music, Chopin distinguished himself from them by shunning most public performances, preferring to play in salons. He considered himself first and foremost a composer, and developed an aversion to the public displays of virtuosity which were a dime a dozen in early 19th century Paris. His music was thus born out of an interesting contradiction which still confronts pianists today: it is immensely difficult music to perform, requiring the highest level of piano technique, but the goals are the expression of pure musical poetry. The performer must be both a master of the instrument as well as in possession of a noble and unostentatious spirit. Études - two sets of 12 and one set of three technical studies for piano that to this day are regarded as a watershed in the progress of any pianist. Unlike those of previous composers such as Czerny and Cramer, Chopin's Études combine technical difficulty with musical expression, thus helping to popularize the form. Nocturnes - slow, dreamlike pieces. The form was originally pioneered by the Irish composer John Field. Mazurkas - an adaptation of a native Polish dance form. These miniatures often show Chopin at his most harmonically adventurous. Waltzes - whilst these did much to contribute much to Chopin's reputation as a 'Salon' composer, the best of them rival his Mazurkas in unusual harmonic adventures. Chopin did not particularly like the form, but used it to write some of his most well-known works. Preludes - Chopin's most explicit homage to JS Bach, written during a period of intense emotional pressure on the island of Majorca - the extremely fragmentary nature of some of them puzzled contemporaries (the shortest last seconds rather than minutes), but some commentators have come to observe the set as a whole as one of Chopin's most satisfying works. The 24 Preludes, Op. 28 were modeled directly after Bach's Well-Tempered Clavier. Impromptus - free-form compositions in an improvisatory style. Most famous of these is the Fantaisie-Impromptu, Op. 66, published posthumously. 4 Scherzi - Set in a large ternary form, these works depart from the usual humorous connotation of the scherzo genre. Chopin was one of the first composers to write the scherzo as a stand-alone piece rather than as a movement in a larger work. 4 Ballades - Works with no set form, likely inspired by the poetic "Ballade," which seem to follow an inexplicit dramatic narrative. These four works, especially the first and fourth, are some of the composer's most popular large works. 10 Polonaises - another Polish dance form, longer and more stately than the mazurka. Fantasia, op. 49 and the "Polonaise-Fantasie" - Two large, free-form works which are difficult to categorize but very effective dramatically, containing some of his most sophisticated music. Sonatas - Chopin's first sonata in C minor was composed in his youth and is usually not performed today. His second sonata in B-flat minor is extremely popular, particularly the famous "Funeral March movement", although in his day it was criticized for perceived structural deficiencies. Chopin attempted to address some of this criticism in his third and final piano sonata in B minor. Concerti - Chopin wrote two piano concertos in his youth, along with four other pieces for piano and orchestra. The concertos, while written when he was very young, are nevertheless staples of the piano concerto literature. The Frederic Chopin International Piano Competition is held every 5 years and is considered to be among the top tier of international music competitions today. Named in his honor, it requires entrants to play almost every category of his output, including his concertos. Perhaps the most famous winner of this competition is Martha Argerich. ↑ George Marek R. and Maria Gordon-Smith, Chopin. A biography. Harper & Row, New York, San Francisco, London 1978. ↑ Michałowski, Kornel/Samson, Jim: "Chopin, Fryderyk Franciszek", Grove Music Online, ed. L. Macy (subscription required). ↑ , the official site of the Frederic Chopin International Piano Competition. This page was last modified on 26 August 2016, at 10:14. This page has been accessed 10,060 times.